How to maintain a shade sail? The maintenance of a shade sail will depend on four main criteria: return it when the weather requires it, tender it to evacuate the rainwater, clean it with appropriate products and store it in good conditions. conditions. Why do you have to fold your shade sail? It may not be possible to store all equipment in your facility in a sheltered space, but the shade sail, folded over and stored in a storage bag , will not take up space. It will be better protected by spending the winter indoors, which will allow you to keep it, under good conditions, for several years. Winter is not the only season when you have to put away your canvas: as soon as weather forecasts predict stronger winds or periods of snowfall, it is more than advisable to fold your sail. shading so that it does not deteriorate. If you go away for several days, even in the middle of summer, it will also be preferable to avoid the risks due to weather conditions. To solve this problem, you can then opt for sails with automatic reel , much easier and quick to handle. How important is the tension of the shade sail? A shade sail will inevitably, one day or another, exposed to rain. If it is not sufficiently tight, the rain will not be able to escape from the sail properly. It will then stagnate, creating pockets of water that may deform the sail. The water-repellent sails are even more exposed to this phenomenon. For this reason, it must be ensured that the fabric is well tensioned, smooth, and also that it is inclined so as to naturally guide the water towards the outside of the sail. Do not hesitate to tighten the canvas regularly if you find that it has a less rigid appearance. You will need to check this tension several times per season, or even weekly depending on the conditions in which it is exposed. How to clean a shade sail? A shade sail will inevitably be exposed to many elements: sun, rain, dust, traces of insects or animals ... All elements against which you can not fight and which may leave traces on your sail. This is not a fatality. For starters, if you really fear stains, opt for darker, less messy canvases. Then, cleaning with a damp cloth and soapy water will remove most of these traces. To guarantee the life of your fabric, avoid abrasive cleaners and high pressure cleaners. If necessary, you can use a shade sail cleaner , before rinsing with large amounts of water and letting your sail dry. It is recommended to carry out a regular cleaning to avoid a too strong fouling of the fabric which will be more complicated to make disappear. How to properly store the shade sail? 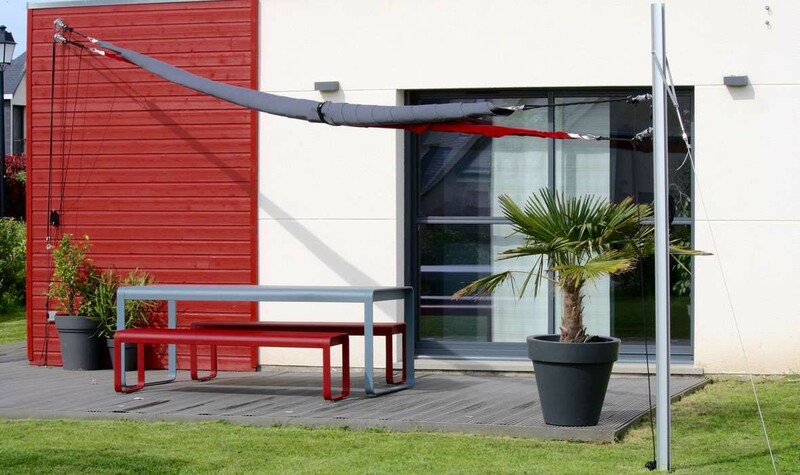 As soon as the summer season is over, you can put your shade sail in a dry place. To avoid damaging it, do not fold it if it is still wet, and think, at least, to dust it before storing it. You will also protect it from new dust deposits by using a storage bag adapted to its size that will allow you to also store the fastening material corresponding to the sail. When dismounting the sail. Spotting together, using a colored woolen brown or string, one of the corners of the sail corresponding to an anchorage point on the wall or on a pole; In order to facilitate the reassembling of the sail the following season. To read also: How to fix a shade sail on a wall?